The President and committee of the Medbourne Autumn Club held an Extraordinary Meeting on Wednesday, 3rd April, 2019 at 13 Rectory Lane, Medbourne. It was felt that the membership of the Medbourne Autumn Club had dropped considerably and it no longer served the purpose for which it was originally intended. It has been a wonderful Club for more than sixty five years, bringing entertainment and enjoyment to the older people of Medbourne and surrounding villages. With very much regret the President and Committee voted unanimously that the Club should be wound up with immediate effect. The subscriptions that have been paid will be returned. The remaining funds of approximately £1,000 will be distributed between the Village Playground, the Church Fabric Fund, the Parkinson’s Trust and the Parish Magazine. Welcome to this site for the village which combines three village sites: The Village web site, the Parish Council web site and that for the Village Hall. This follows a decision by Leicestershire County Council to terminate, in August 2016, the infrastructure hosting the first two of those sites. We hope you find that the site provides a rewarding browsing experience. Comments are welcome; please send them to the Site Administrator. Medbourne is situated in the Welland Valley in southeast Leicestershire; it falls within Harborough District. Main Street, the spine of the village, has postcode LE16 8DT. 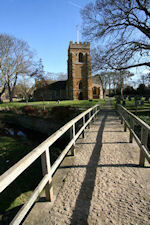 Medbourne is an ancient village with a medieval stone bridge over a brook, a beautiful church and a traditional pub. Medbourne was originally a Roman settlement, on the route from Leicester to Colchester. The village lies in a valley carved out by the Medbourne Brook, which is a tributary of the river Welland. Nowadays, Medbourne is a conservation area whose historic stone cottages, large elegant houses and leafy walks combine to make the village one of the most picturesque in the Welland Valley. If you want to know more about Medbourne it's all here - its community, its businesses and its history. Previously, email sent to admin@medbourne.org.uk was not being delivered. Thanks to BT Support I now have a fix, so admin@medbourne.org.uk is now the recommended way to contact site administration.